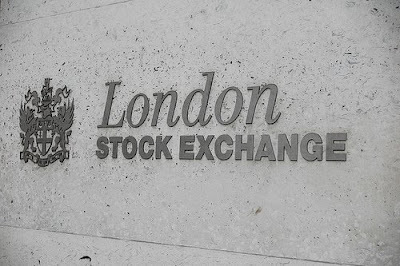 We hear a great deal about the London Stock Exchange. It goes up and down and this is supposed to make us feel happy or sad, but who actually knows where the Stock Exchange is? Well your author can confirm it is a real place, just around the corner from St Paul's Cathedral, at 10 Paternoster Square, EC4M 7LS. Whilst the Exchange itself is over 300 years old, having begun in the coffee houses of 17th century London, it only moved to its present location as recently as 2004, so its history there is rather limited. The building was opened by Queen Elizabeth II on 27 July 2004, and contains a specially commissioned dynamic sculpture called "The Source", by the Greyworld collective. It was originally designed to display words randomly extracted from the internet, but after a few rude words came up that bit was abandoned. For more on the Stock Exchange, see here.